Before the banquet began in the evening, we cut the picture-taking short (cutting out the SI Ferry option) and headed back to Ctown so that we could get the tea ceremony started. There was a bit of traffic, especially on the street leading to the restaurant. Our photographer got out of the car so that he could capture shots of us arriving and I think he must've waited at least 15 minutes for those few paces. The bridal party, behind us, decided to just walk and they got there way before we did. When we got to the restaurant, Judy, our fantabulous baker, had just finished setting up the cake. It was so nice, exactly the way I wanted and yet way beyond my expectations. I think we were still communicating about flowers a few days before the wedding and I just gave her free reign because indecisive me couldn't decide on a lot of things. 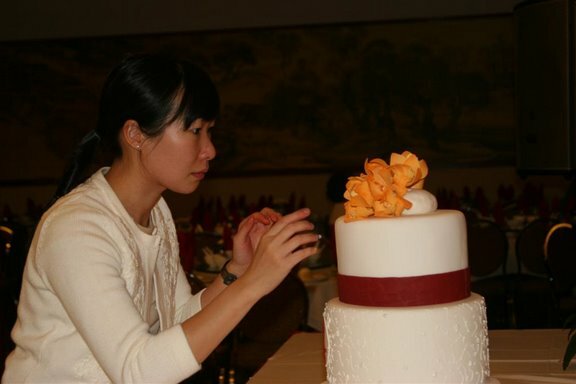 She ended up creating a bunch of yellowish-orange sugarpaste orchids for the cake-topper and at first I thought they were real! Everything that I could decide on and asked for was created exactly the way I wanted, down to the same shade of red that I love from the invitations. 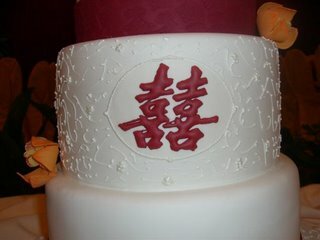 From the flowers to the double happiness monogram in royal icing, to the cherry blossom texture on the middle tier, to the red bands stamped with an image of a Chinese knot I found on an envelope, I really loved how the cake turned out and to try to describe how beautiful it was would just ruin it. Do you see how she even piped the cherry blossom design onto the board that the cake is sitting on? Someone captured this moment while Judy was setting up -- look at the deep concentration! I love Judy's work and I think she was the best vendor we dealt with, coming up with exactly what I wanted. She has a lot of good ideas and her work is exquisite! And her pricing is a lot more affordable than other bakers that we checked with for the type of cake we wanted. She is also very accessible -- we met with her several times to discuss the design and flavors, plus we communicated regularly through email. At the tasting, we couldn't decide which flavor we liked more so we chose both the mocha cake with raspberry filling and the lemon cake with strawberry filling as different tiers. I think the mocha turned out a LOT better than the lemon (though the lemon wasn't bad either) and I even had guests ask for more of it when only the lemon was left. Someone also said that he doesn't usually like that type of cake (chocolate with fruity flavors) but he still really enjoyed it. Unfortunately, a lot of guests also said that they didn't partake of any of the scrumptiousness b/c the MC neglected to mention that there was cake to the side (more on THAT some other time -- hrmph!!). But can I really complain, since we got all the leftovers?! :D We cut a section to freeze for our one-month anniversary (yesterday, btw, but we totally forgot!) and we also had slices here and there for the first two weeks when I allowed myself to eat with reckless abandon again. But I digress, I HIGHLY recommend Silk Cakes! 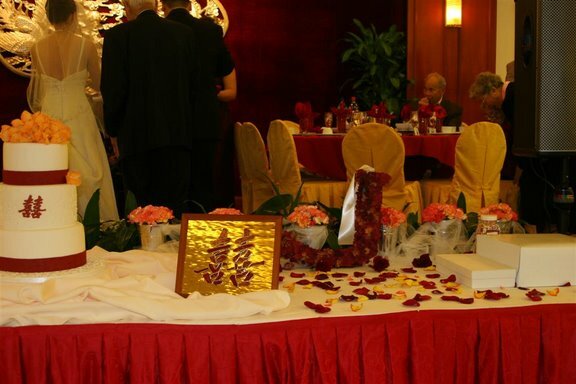 I don't know who exactly set stuff up at the restaurant, but the favors and bottles of wine (or at least most of them) eventually made it to the tables, as did the table/menu cards. 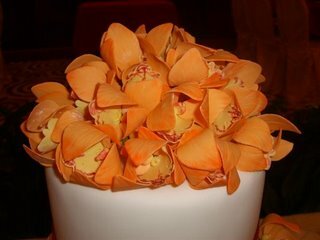 The cake table was also made gorgeous by BM's sister, who set up the buckets of flowers from the ceremony in a line across the back of the table. Such a simple presentation that did just the trick! 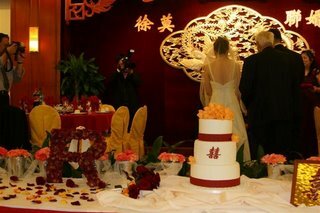 She also propped up the floral monograms so that they flanked either side of the cake, and spread leftover petals on the table. I was so pleasantly surprised at how romantically lush it came out! At the beginning I really didn't want to do the tea ceremony thing b/c I thought it would take up too much time and in some instances I don't really want to pay respect to ppl that I don't really know (like some 'aunt' who I still don't quite understand the relation of). 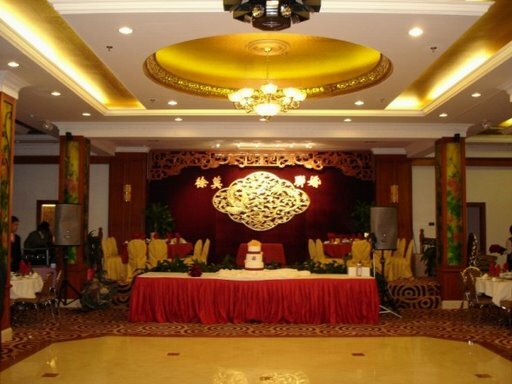 But it was kinda cool to have that time with each set of relatives, sorta talk to them, and to serve them tea, kinda like a receiving line on steroids (only they were sitting and we standing). Originally we were supposed to kneel to the elders but Dear adamantly refused. I thought he was being picky but then I learned this was some sort of pagan ritual so I fought for it too. I felt a bit guilty about this since my mother had already purchased the pillows and the specially embroidered pillowcases but in the end she understood (or got so tired of fighting me on every little thing that she gave up). However, either my parents didn't communicate with each other (highly likely) or my father forgot, but when it came their turn to be served tea, my father kept saying "Aren't they supposed to kneel?" I found that kinda funny too. Besides a bunch of gold bracelets and stuff, my mother also gave me a pair of gold screwpost earrings with diamonds -- the posts were so thick it hurt to stick it in my ears, but everyone said I had to wear everything to show respect. After a while, I started to look like the female (and Chinese) version of Mr. T. And Dear's tux pocket was stuffed with envelope after envelope that we each received from each set of elders. I wish we kept better track of these. :( Also, I still think that my older brother should have been included in this lineup but my family insisted that he shouldn't be because he's not yet married. What irked me more is that later on, when our families were introduced, he was excluded yet again, as if I don't have a brother. Even Dear's younger brother was introduced then! Friggin' distant aunts were mentioned but not my brother -- how much closer of a relation can you get than siblings?! I love your cake! 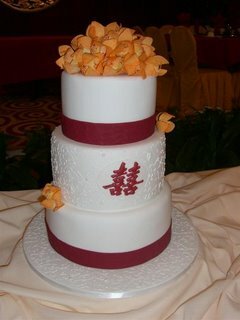 It's a great combination of a modern wedding cake style, with traditional Chinese touches. 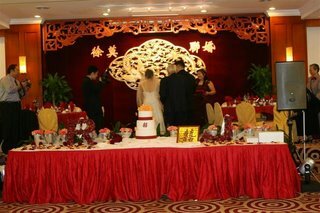 I'm definitely writing down your cake vendor for when it comes time for me to plan my Chinese banquet!